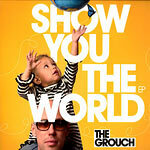 A while back, we were told that the only thing that might possibly appear on vinyl from the Grouch off of his new album Show You The World, was the addition of perhaps only a single with a remix. This much is still true by the way, as the ''Artsy'' 12 inch is on its way. But that was before German label Hip Hop Vinyl got their hands on it! Collecting ten tracks off of the album, the Show You The World EP is as close as it's going to come to owning this brand new addition to Grouch's discography on wax! Still one of our top sellers here at Access and a staff favorite for one of the best albums of the year, it is limited to only 500 copies world wide! It's an import and may be a little pricey, but Hip Hop Vinyl (in Germany) is responsible for blessing us with The Nonce and Bored Stiff on vinyl when no other label would...so keep that in mind.